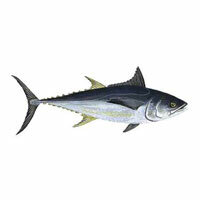 Occurrence: Tuna is eaten cooked from fresh fish and also raw as sushi (sashimi). It is the fish which is canned in the largest quantity and is consumed in larger quantities in many western cultures than any other fish. Tuna species include longtail tuna (Thunnus tonggol, NEWT 48169), bluefin tuna (Thunnus thynnus, NEWT 8237, bigeye tuna (Thunnus obesus, NEWT 8241), yellowfin tuna (Thunnus albacares, NEWT 8236), and blackfin tuna (Thunnus atlanticus, NEWT 48168). Several studies of fish allergy mention both symptoms and allergic reactions to tuna but do not associate symptoms specifically with tuna ingestion. For example, Bugajska-Schretter et al. (1998)  note that 2 patients reported asthma and urticaria and that these patients had reacted to tuna and to four other fish. Similarly, Helbling et al. (1996)  describe the symptoms of 39 patients as pruritus (27/39), hives (27/39), asthma and wheezing (21/39), angioedema (20/39), dyspepsia and cramps (7/39), vomiting (3/39), shock (3/39) and fainting (2/39). 13/39 patients had a history of allergic reaction following ingestion of tuna, 15/39 had a positive SPT but only 5/27 a positive RAST to tuna. Kelso et al. (2003)  reported that a 19-year-old man had had episodes of total body flushing and itching with facial and throat swelling after eating canned tuna. On some occasions, the throat swelling resulted in shortness of breath. James et al. (1997)  reported a 12 year old boy and a 36 year old man with histories of anaphylaxis after eating tuna. A further adult with a history of anaphylaxis with other fish was identified by challenge as tuna allergic. Kelso et al. (2003)  made crude extracts by pulverizing small amounts of canned tuna and fresh tuna in saline and used a commercial cod extract. James et al. (1997)  used commercial extracts. Tuna was from Center Laboratories and was diluted 1:10 (w/v) by 50% glycerinated saline. Helbling et al. (1996)  made an extract of tuna (and of Alaska pollack, anchovy, mackerel, rainbow trout, and salmon) by blending 500g of raw fish in 1L of 0.01M PBS, pH 7.2, in a Waring blender for 1-3 minutes at room temperature. The mixture was extracted overnight at 4°C and centrifuged (70,000 g). Supernatants were concentrated with an Amicon YM1 filter (molecular weight cut-off 1 kDa) and recentrifuged (180,000 g). The extracts were sterile filtered and checked for sterility. Samples were diluted to 10 mg./ml. with sterile glycerol. 4 crustacea were extracted similarly except that the flesh was initially boiled for 15 minutes. Results were compared with 16 commercial extracts of fish as well as 12 inhalant allergens. Bernhisel-Broadbent et al. (1992)  added 10 g. of raw and cooked fish (catfish, bass, perch, mackerel, tuna, salmon, trout, codfish and flounder) to 40 ml. phosphate buffered saline in centrifuge tubes with a glass marble. The tubes were placed in a test tube rotator overnight at 4°C. Samples were centrifuged at 1250 x g for 15 min and then at 16000 x g for 15 min. Supernatants were lyophilized. Skin tests used 1:20 (w/v) diluted extracts of raw fish. de Martino et al (1990)  used commercial extracts (Lofarma, Milan, Italy). The extracts were diluted 1:20 (w/v) in a glycerol solution. Kelso et al. (2003)  used histamine as a positive control and 50% glycerine as a negative control. James et al. (1997)  considered a skin test positive if the wheal diameter was at least 3 mm greater than that of the control of 50% glycerinated saline. Helbling et al. (1996)  defined a positive skin prick as producing a 3 mm diameter wheal in a patient who reacted to the positive control (1 mg/ml histamine diphosphate) and not to 50% glycerol in PBS. Results were recorded after 15 minutes. Bernhisel-Broadbent et al. (1992)  used 1 mg/ml histamine as a positive control and saline as a negative control. Wheal with diameters 3 mm greater than the negative control were considered positive. de Martino et al (1990)  used histamine hydochloride, 1 mg/ml, as a positive control and a glycerol solution as a negative control. Diameters were read after 15 minutes and reactions half or more than the size of the positive control, read after 10 minutes, were considered positive. Kelso et al. (2003)  tested a single patient. James et al. (1997)  tested 5 children and 5 adults with histories of fish allergy. Helbling et al. (1996)  tested 39 subjects. Bernhisel-Broadbent et al. (1992)  tested 11 patients with histories of fish allergy and 20 controls including 10 atopic patients with other food allergies. de Martino et al (1990)  tested 20 cod allergic children and 40 children who had a positive SPT and RAST to a different food. Kelso et al. (2003)  reported wheal diameters of 6 mm for cod and canned tuna and 5 mm for fresh tuna for their patient. The flare diameter of 50 mm was also greatest for canned tuna. James et al. (1997)  reported that all 5 children and 5 adults gave positive SPTs with some fish extracts. 2 children reacted to tuna and one of these only reacted to tuna. All five adults reacted to tuna. Helbling et al. (1996)  found that 15/39 fish allergic subjects gave a positive skin test to tuna. Bernhisel-Broadbent et al. (1992)  reported that 9/11 patients gave positive SPTs with tuna extract. The wheal diameters were 4-11 mm which was the second lowest reaction with only sardines (8 positive and 4-8 mm diameters) showing a weaker response. Cod extract produced 9/11 positive wheals with 4-40 mm diameters. de Martino et al (1990)  reported that 11/20 of the cod allergic children reacted to tuna extract. 2 of the cod negative children also reacted to tuna. Kelso et al. (2003)  made crude extracts by pulverizing small amounts of canned tuna and fresh tuna in saline. Shiomi et al (1999)  made an extract from bigeye tuna, Thunnus obesus, by homogenizing with 3 volumes of PBS (0.15 M NaCl, 0.01 M phosphate buffer, pH 7.0). This was heated to 100° C for 10 minutes, cooled to 5° C and centrifuged at 18000 x g for 20 minutes and the supernatant was used. Bugajska-Schretter et al. (1998)  made an extract with one gram of raw fish muscle of each species, homogenized under liquid nitrogen, dissolved in Laemmli sample buffer, with or without 2-mercaptoethanol (1.25% v/v), and boiled for 10 minutes. In order to remove insoluble particles, extracts were centrifuged at 4500 rpm for 10 minutes at 4° C, and supernatants were stored in aliquots at –20° C. Commercial extracts were used for CAP-FEIA. James et al. (1997)  made an extract of fresh raw tuna fillet by homogenization of 500 g in 1L of 0.1 M PBS (pH 7.2) in a Waring blender for one to three minutes at room temperature. The homogenate was extracted overnight at 4° C under constant stirring, centrifuged (70,000 g) and the supernatant concentrated on an Amicon-YM2 filter (Amicon, Danvers, MA; MWCO 1 kD). The concentrate was recentrifuged (180,000 g) and the supernatant aliquoted and stored at -20° C.
Bernhisel-Broadbent et al. (1992)  used the extracts described for skin tests. Shiomi et al (1999)  and Bernhisel-Broadbent et al. (1992)  used ELISA, ELISA inhibition and RAST. Swoboda et al (2002)  tested 8 sera from 16 fish-allergic patients. Bugajska-Schretter et al. 2000  tested 8 sera from 11 fish allergic patients. Shiomi et al (1999)  used sera from 5 fish allergic subjects. Yamada et al. (1999)  tested 8 sera from tuna allergic patients purchased from Plasma Lab International (Everett, WA, USA). Bugajska-Schretter et al. (1998)  tested sera from fish allergic 30 patients (29 were tested with tuna). Bugajska-Schretter et al. (1998)  report positive RASTs, class 2-4, with all 30 patients with cod extracts and class 1-4 with salmon and tuna (only 29 tested with tuna). Shiomi et al (1999)  report that IgE from all 5 sera bound allergens in the tuna extract. Purified tuna parvalbumins bound IgE from 2 sera by ELISA. The other 3 sera did not bind parvalbumin. Gel filtration on Sephadex G-75 of the extract showed that 2 of these sera bound to allergens near the void volume while the other sera bound both high and low mass allergens. Similar binding was seen for these sera with eel extracts. Bugajska-Schretter et al. (1998)  and Bugajska-Schretter et al. 2000  separated proteins using 12% SDS-PAGE, by the method of Laemmli (1970) . Extracts were heated at 95° C for 3 minutes. Yamada et al. (1999)  separated proteins on 10-20% Tris-HCl linear gradient SDS-PAGE with a 4% stacking gel. Samples were reduced and denatured by heating for 5 minutes with 4% SDS and 0.2 M DTT. Bernhisel-Broadbent et al. (1992)  and Bernhisel-Broadbent et al. (1992)  separated proteins by SDS-PAGE by the method of Dreyfuss et al. (1984) . Yamada et al. (1999)  electrophorectically transfered proteins to 0.2μm nitrocellose paper (Biorad, CA, USA) by the method of Towbin et al (1979) . The membranes were blocked with SuperBlock™ blocking buffer (Pierce, IL, USA) for 45 minutes. The membranes were washed 3 times with PBS and incubated with patient's sera (undiluted) for 18 hours at room temperature. The membrane was washed 3 times with 0.3% Tween in PBS and 2 times with PBS. The membranes were incubated with horseradish peroxidase labelled goat anti-human IgE with constant rocking for 2 hours at room temperature. The membranes were washed and IgE binding revealed with Metal Enharnced DAB Substrate (Pierce, IL, USA). Bernhisel-Broadbent et al. (1992)  and Bernhisel-Broadbent et al. (1992)  transferred proteins electrophoretically onto nitrocellulose membranes in Tris-glycine buffer (pH 9.1) containing 20% methanol. These were blocked in PBS with 0.5% porcine gelatin and 0.05% Tween 20. The membranes were probed with 1:25 diluted sera from fish allergic patients. Bound IgE was revealed by biotinylated goat anti-human IgE, followed by reaction with an enzyme horseradish peroxidase-avidin-D solution (Vector Laboratories, Burlingame, CA). Kelso et al. (2003)  reported that sera from their single patient with allergy to canned tuna bound to high molecular mass proteins (50 - 120 kDa) from canned tuna. These were not bound by sera from a "typical" fish allergic patient. Bugajska-Schretter et al. 2000  report that preabsorbtion of sera from 11 fish allergic patients by carp parvalbumin caused mean inhibition of IgE binding of 81% to cod (55%-91%), 89% to tuna (60%-98%), and 78% to salmon extract (55%-93%). Similarly, Swoboda et al (2002)  reported that when sera from 16 fish-allergic patients were preadsorbed with rCyp c 1.01, this strongly inhibited IgE binding to natural fish extracts (i.e. cod, 62–96%, 76% mean inhibition; tuna, 33–98%, 69% mean inhibition; salmon, 41–95%, 70% mean inhibition). Yamada et al. (1999)  reported that IgE from 8 sera from their patients bound differently to extracts of albacore and yellowfin tuna and to extracts of raw, cooked and canned tuna (species was not explicitly given). The individual sera also differed. IgE from sera c and e bound to raw tuna ; from b, c, g and h to cooked; c and h to canned; a, c, e, f, g and h bound to defatted albacore; all 8 sera a-h bound to defatted yellowfin extract. One serum (g) bound to a 12 kDa protein, which may be a parvalbumin. At least 4 sera bound to a 32 kDa protein found in both albacore and yellowfin. Yellowfin extract showed a smear of proteins around a 46 kDa IgE binding band, especially with sera c and h, which was identified as the most important tuna allergen. Yamada et al. (1999)  suggested that the 32 kDa protein may not be a significant allergen as histamine release assays showed a stronger response with yellowfin tuna. Bugajska-Schretter et al. (1998)  reported that all 28 sera contained IgE binding a protein in cod and carp extracts at 12 kDa (parvalbumin; see cod and carp entries). 3 sera were immunoblotted with extracts of cod, tuna, salmon, perch, carp, and eel, prepared under nonreducing or reducing conditions. Non-reduced tuna extract showed binding at 12 kDa and 66 kDa to serum 1 (with a weak band at 46 kDa), at 46 kDa for serum 2 and at 12 kDa for serum 3. Reduction removed the bands at 46 kDa with a new band at 29 kDa for serum 2 but did not change IgE binding at 66 or 12 kDa. The degree of inhibition of IgE binding to tuna, salmon, perch, carp and eel obtained after preadsorption of the four sera with cod extract was determined by gamma counting giving 91%, 84% and 84% for 3 sera with tuna (1 serum did not bind the tuna extract). James et al. (1997)  reported that only a 40 kDa allergen tuna using serum from a pediatric patient with isolated tuna anaphylaxis revealed an IgE binding protein band at 40 kD. Bernhisel-Broadbent et al. (1992)  reported that IgE from the sera of fish allergic patients did not show clear binding to tuna extracts near 13 kDa. Bernhisel-Broadbent et al. (1992)  initially gave 2 challenges per day of 2 ounces (uncooked weight) of cooked and lyophilized fish (2 ounces = 57 g). The placebo was either Nutramigen (Bristol-Myers, Evansville, IND) or canned tuna (see Bernhisel-Broadbent et al. 1992 ) in 100 mls of juice. After a negative DBPCFC, an open challenge of 4 ounces (114 g) was given. Later challenges used doses of 3 ounces (85 g) in 150 mls of juice. Bernhisel-Broadbent et al. (1992)  used canned tuna for open challenge. 90 to 180 g was consumed. Bernhisel-Broadbent et al. (1992)  used blind followed by open challenge if negative. Bernhisel-Broadbent et al. (1992)  reported open challenges. Bernhisel-Broadbent et al. (1992)  reported 2 open challenges with canned salmon and 45 open challenges with canned tuna. Bernhisel-Broadbent et al. (1992)  reported negative challenges with all 11 patients. Bernhisel-Broadbent et al. (1992)  reported only negative challenges with canned salmon and tuna. They also note that fish allergic patients had been able to eat these canned fish normally for 2 years. This was attributed to the very long heat treatment of the canning process of approximately 14 hours. It was noted that SDS-PAGE showed smears rather than strong discrete bands in extracts of canned fish. Van Do et al (2005)  used SPT and ELISA inhibition with 12 patients and their sera to characterize the cross-reactivities of native (partially purified) and some recombinant parvalbumins from 9 species (cod, Gadus morhua, Atlantic salmon, Salmo salar, Atlantic mackerel, Scomber scombrus, tuna, Thunus albacares, herring, Clupea harengus, wolffish, Anarhichas sp., halibut, Hippoglossus hippoglossus, flounder, Platichthys flesus, and Alaska pollack, Theragra chalcogramma). Cross-reactivity was generally observed although some parvalbumins were poor inhibitors of IgE binding to cod for some sera. Tuna gave similar inhibition to most other parvalbumins. Helbling et al. (1999)  using RAST reported little binding by tuna extract of IgE from sera of 8 patients who were challenge positive with cod, catfish or snapper. It is tempting to speculate that as parvalbumin is more important at lower temperatures (Rall, 2005 ; Nelson et al 2003 ) and as tuna maintain their muscles at higher than ambient temperatures (Stevens et al. 2000 ), tuna will require much lower parvalbumin concentrations than cold temperature fish such as cod. This might cause methods using extracts to show weak responses while purified tuna parvalbumin will bind IgE. However, there is also evidence that tuna allergy is associated with higher mass allergens. Lim et al. (2005)  showed that the differences reported between tuna and other fish were partly caused by the distribution of parvalbumin within tuna. Parvalbumin was only found in white meat of Thunnus tonggol and the concentration was highest towards the rostral (head) end. Thus tests for tuna allergy need to specify which muscle was used. Hamada et al (2001)  and Hamada et al (2003)  give data on the allergenicity of tuna collagen and Andre et al (2003)  on the allergenicity of gelatine made from tuna collagen. Scombroid fish (mackerel, tuna, marlin, swordfish, albacore, bonito, skipjack, and almost 100 other species) have a high concentration of histidine which functions to buffer the pH. Thus only a few hours at room temperature can allow bacteria to generate toxic levels of histamine. As histamine is the main mediator of IgE mediated allergic reactions, the symptoms of histamine poisoning are similar to allergy to fish (Ohnuma et al. 2001 ; Attaran & Probst, 2002 ). Several other (non-scombroid) species of fish such as sardines have also been associated with cases of histamine toxicity. Allergic reactions to Anisakis have been associated with consumption of tuna (Magnaval et al. 2002 ). Kelso JM, Bardina L, Beyer K.
Yamada S, Nolte H, Zychlinsky E.
Identification and characterization of allergens in two species of tuna fish. Lim DL, Neo KH, Goh DL, Shek LP, Lee BW. Missing parvalbumin: Implications in diagnostic testing for tuna allergy. Hamada Y, Nagashima Y, Shiomi K.
Identification of collagen as a new fish allergen. Andre F, Cavagna S, Andre C.
Gelatin prepared from tuna skin: a risk factor for fish allergy or sensitization? Shiomi K, Hamada Y, Sekiguchi K, Shimakura K, Nagashima Y.
Magnaval JF, Berry A, Nadrigny M.
Bernhisel-Broadbent J, Strause D, Sampson HA. Fish hypersensitivity. II: Clinical relevance of altered fish allergenicity caused by various preparation methods. Energetics, mechanics and molecular engineering of calcium cycling in skeletal muscle. Stevens ED, Kanwisher JW, Carey FG. Muscle temperature in free-swimming giant Atlantic bluefin tuna (Thunnus thynnus L.). Nelson T, McEachron D, Freedman W, Yang WP. Hamada Y, Nagashima Y, Shiomi K, Shimojo N, Kohno Y, Shibata R, Nishima S, Ikezawa Z.
Reactivity of IgE in fish-allergic patients to fish muscle collagen. Allergen epitopes:Bugajska-Schretter et al. (1998)  show that IgE binding to cod and carp beta-parvalbumin is very much stronger in the presense of calcium, when the protein is in its native folded form, suggesting that the epitopes are primarily conformational. Van Do et al (2005)  used SPT and ELISA inhibition with 12 patients and their sera to characterize the cross-reactivities of native and some recombinant parvalbumins from 9 species with cod. For most sera, native tuna parvalbumins caused significant inhibition of IgE binding to cod parvalbumin. Parvalbumins control the flow of calcium from troponin C back to membrane bound pumps after a muscle contraction. Each parvalbumin can bind two calcium or (with lower affinity) magnesium ions. Shiomi et al (1999)  purified allergens from bigeye tuna, Thunnus obesus, starting from an extract of muscle made by homogenizing with 3 volumes of PBS (0.15 M NaCl, 0.01 M phosphate buffer, pH 7.0). This was heated to 100° C for 10 minutes, cooled to 5° C and centrifuged at 18000 x g for 20 minutes. The supernatant was purified by gel filtration on a Sephadex G-75 column (2.5 x 90 cm) equilibrated with PBS and eluted at 35 ml/h. Allergen containing fractions were combined and applied to reverse-phase HPLC on a TSKgel ODS-120T colun (0.46 x 25 cm). Fractions were eluted at 1 ml/h. with a 35-55% gradient of acetonitrile in 0.1% trifluoroacetic acid in two peaks, Thu o 1.01 and Thu o 1.02. The yield was 14 and 8.3 mg from 320 g of tuna muscle. Van Do et al (2005)  also report a partial purification of parvalbumin from tuna, Thunus albacares, without details. There are two families of beta-parvalbumin sequences in several fishes. One group includes Q90YK7 (Alaska pollack), Q91482 (salmon) and Q90YK9 (cod) and the other Q90YK8 (Alaska pollack), Q91483 (salmon) and Q90YL0 (cod). Each groups shares approximately 75% sequence identity and each sequence has 65-67% sequence identity with members of the other group.